This is the first in a series of blogs that I will be writing over the period of the World War I Remembrance. We have spent the last year thinking about the whole concept of the war and the four years of horror that affected so many families across the globe. From this month, we will no doubt be thinking about individual battles as they took place, but unlike in previous conflicts these battles could last months rather than just a day or so. 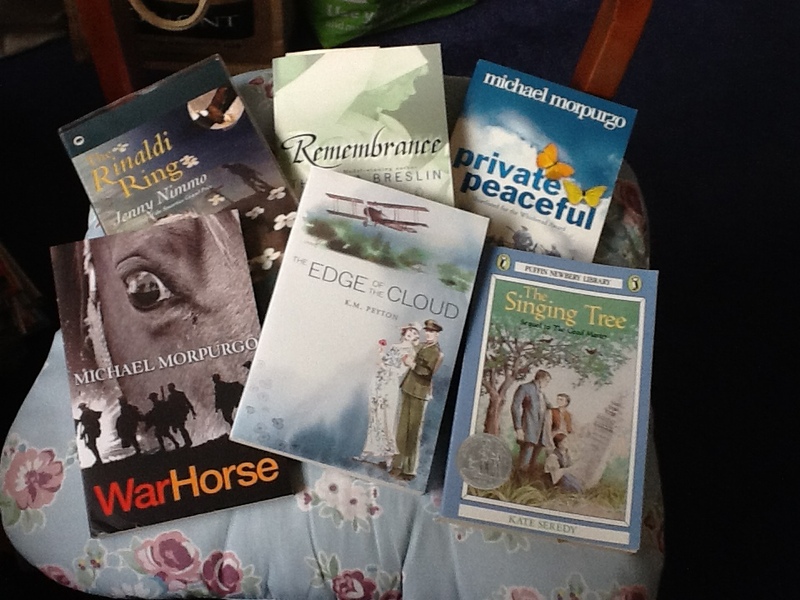 I have tried to consider the best way to arrange the books that I am going to highlight in the blogs, but apart from a slight grouping by age range I have decided not to put them into any ‘box’. Before last year there had always been a small number of titles that were based in the war period but in the last few months there has been a tremendous increase in works being published. I first started to think about what books were available well over a year ago, as I knew that schools would be asking for suggestions and I was thinking about a short training session to highlight resources. there are a group of books which have our relationship with animals at the core of the story. Sometimes they are based on a true story, whilst others are imaginary events, but based on issues that did occur during the war. “War Horse”, by Michael Morpurgo has become something of a phenomenon. Not only has it been an immensely successful film and stage show (I am seeing it for the second time in January 2015), but Michael Morpurgo has put together a really moving event, with readings from the book and songs from the stage show. 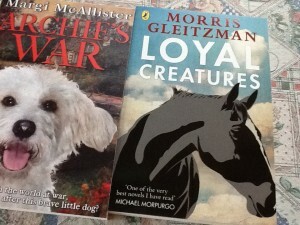 Morris Gleitzman has also written a tribute to the animals that went to war. His “Loyal Creatures” has taken a similar theme to Morpurgo ( it is based on a workshop script for the “War Horse” tour of Australia) and acknowledges the support he received. However his work is set in the surrounds of the Dardanelles campaign and Gallipoli and the ending is not as positive as we would like, but it is very realistic and haunting. One of the highights of the past year was “the amazing tale of Ali Pasha” by Michael Foreman, which was based on a true story and was the tale of a young sailor from East Anglia who made a lifelongfriend of the tortoise he found in a pot hole in Gallipoli. The illustrations are atmospheric and often extremely poignant; it really is a lovely book. Another story with a dog as one of the main character’s is “Archie’s War” by Margi McAllister, which follows the life of young Archie as his brother tries to enlist, despite being underage, and the search for the missing son of the ‘big house’. It tells of the realities of war and the tragic consequences to those who went to war and came back, both injured and traumatized by the experience.